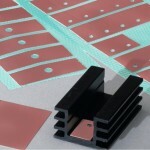 Keratherm Brown represents a well-balanced ratio of cost-effective solution and very good thermal properties. These fiberglass reinforced films along with their very smooth surface exhibit very good thermal resistance properties with a high insulation capacity at low mounting pressures. Click to Get a Quote for Keratherm Brown 70/50!